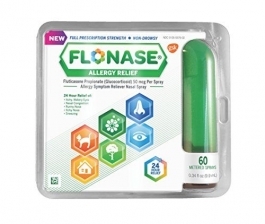 Once-daily FLONASE® is the first and only nasal spray proven to offer 24-hour relief of both nose- and eye-related allergy symptoms. FLONASE® is both nonaddictive and nondrowsy. Only for use in the nose. Do not spray into your eyes or mouth. your symptoms do not get better within 7 days of starting use or you get new symptoms such as severe facial pain or thick nasal discharge. You may have something more than allergies, such as an infection. you get a constant whistling sound from your nose. This may be a sign of damage inside your nose. The growth rate of some children may be slower while using this product. Children should use for the shortest amount of time necessary to achieve symptom relief. Talk to your child's doctor if your child needs to use the spray for longer than 2 months a year. *Total nasal symptoms vs leading allergy pill. **Mechanism vs most over-the-counter (OTC) allergy pills. FLONASE® acts on multiple inflammatory substances (histamine, prostaglandins, cytokines, tryptases, chemokines, and leukotrienes). The exact number and precise mechanism are unknown. Neosporin Maximum Strength Antibiotic Cream plus Pain Relief - 0.5 oz.